Front 9 mostly open with slight elevation. Back 9 has elevation, many trees and water! Rte. 75 north from Tulsa to east on Adams Blvd., 1.4 miles to a left on Madison Blvd. 0.5 mile to park on right, use south entrance. 1st tee by bathrooms (closed) north of the Tower. 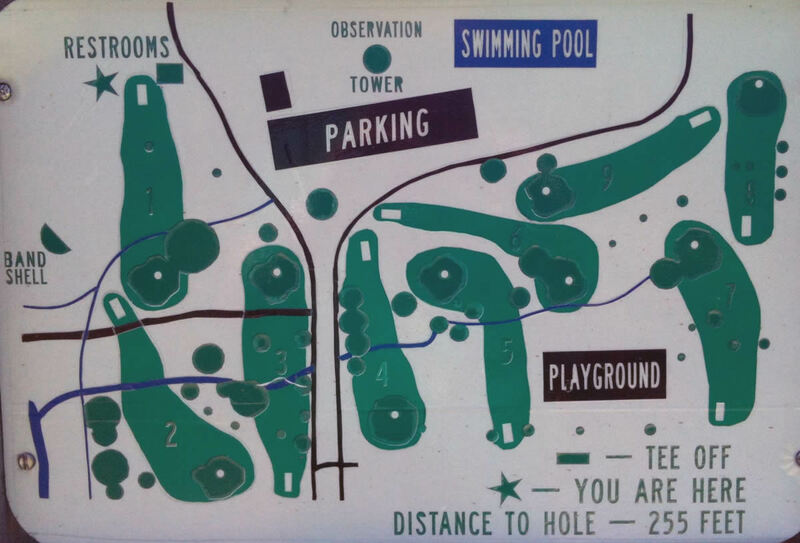 Not a bad course, somewhat challenging in some areas (the water hazard as mentioned previously. Did not have much problem navigating the course other than locating the holes by site. Some long distance throws. Sparsely landscaped, but I guess that is normal for OK. Since it was brown and sparse (played in Sept, 17), the aesthetic was somewhat blah. The Sooner Tower was fun though even if I did get dizzy coming down! I would rate it a 6 of 10 primarily because it lacked an aesthetic to the landscape. Good use of the trees with good topography. Really liked the pond shot. Beware of the standing water in the ditches.